Many counselors learn about ethics in graduate school by applying formal, step-by-step ethical decision-making models that require counselors to be aware of their values and refrain from imposing personal values that might harm clients. However, in the real world, counselors often make split-second ethical decisions based upon personal values. Values and Ethics in Counseling illustrates the ways in which ethical decisions are values—but more than that, it guides counselors through the process of examining their own values and analyzing how these values impact ethical decision making. 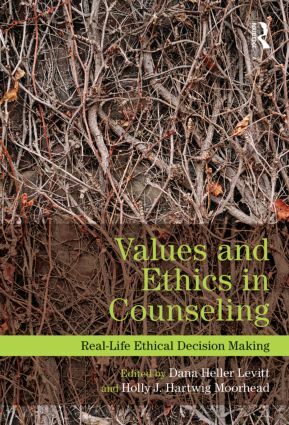 Each chapter presents ethical decision making as what it is: a very personal, values-laden process, one that is most effectively illustrated through the real-life stories of counselors at various stages of professional development—from interns to seasoned clinicians—who made value-based decisions. Each story is followed by commentary from the author as well as analysis from the editors to contextualize the material and encourage reflection.